Beryllium doesn’t react with any of the things in the vessel: H2(g), He(g), Li(s) or LiH(s). My one mole of beryllium powder (which would cost me over $70) would just sit at the bottom of the vessel doing nothing. With not much else to write about in the Periodic Table Smoothie this week, it might be a good idea to calculate how much this Periodic Table Smoothie would have cost in real life. We’ll add boron next week and see what happens. Always label the units of E (kJ or J) above the E. This is the most common source of error in calorimetry calculations. Try this quick way to remember the required units of E: If there’s ΔH in the equation, the units are kJ; otherwise, the units are J. In E=mcΔT, all the variables refer to the mass of water being heated. A common error among students is to use the mass of limiting reactant instead of the mass of water. Generally, m in this equation is 100 g or a similar round number. Never convert ΔT to kelvin. Temperature changes are the same in kelvin and celcius… never add 273 when finding ΔT. No calibration step? Use m×c instead. Because E=mcΔT and E=CfΔT, it therefore follows that Cf ≡ m×c. For example, if we’re heating a 100.0 g of water without a Cf, we should use Cf = 100×4.18 = 418 J K-1 instead. In ΔH = E/n, n denotes the number of moles of limiting reactant. Never add up the number of moles of reactants: use the number of moles of limiting reagent only. Calculate twice. Students most often make mistakes when converting hours or days into seconds. Many answers are therefore wrong by a factor of 60. Do your calculations twice: once while doing the question and again when you check over your answers at the end of the SAC or examination. Know a ballpark figure. Neutralisation and solubility reactions tend to have 2-digit ΔH values; combustion reactions tend to have a 3-digit ΔH and explosive reactions tend to have a 4-digit ΔH. If you get a 5-digit ΔH value, you’ve probably forgotten to convert your answer into kilojoules! Remember the ‘+’ or ‘-‘ sign! The calculator doesn’t know whether the answer should be positive or negative. Think about it yourself instead: endothermic reactions need a ‘+’ sign and exothermic need a ‘-‘ sign. VCAA awards a whole mark for getting the ‘+’ or ‘-‘ sign correct! It’s possibly the easiest mark in the whole paper. Consider getting a home tutor who can answer your questions and explain difficult concepts to you. Students learn much faster with a tutor than on their own. For more Study Tools for Year 12 students, click here. You perform much better when you warm up before strenuous physical exercise. 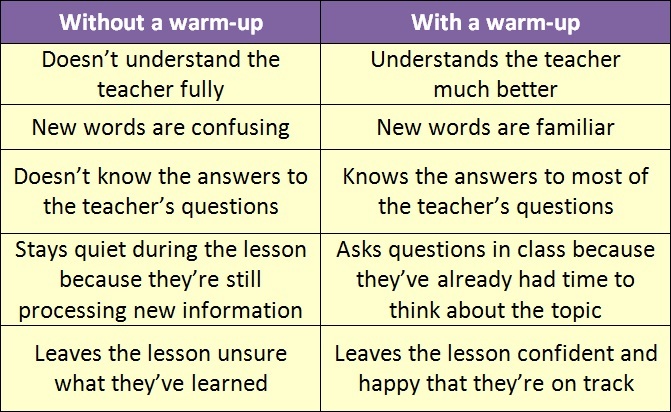 The same applies to Chemistry, too: if you warm up your brain before coming to class, you’ll feel more alert during the lesson and you’ll learn heaps more as a result. Here are some of the benefits of warming up before coming to class. One of the best warm-up drills is to read the relevant textbook section before going to class. Try to pre-read your textbook section no more than 24 hours before the lesson takes place; for example, during breakfast. Even though not all of the information made sense to me during this initial pre-read, it will at least make you understand the lectures a little better. Knowing key definitions before the lecture begins is crucial to understanding much more of what the lecturer is saying. You’ll also walk into the classroom with questions already in your head, ready to ask. This impresses the teacher and your classmates. Learn more about how to use a textbook here. FOCUS during the lesson and make Cornell Notes while the teacher is talking. In addition to writing down key information the teacher tells you and writes on the board, write down any questions you might want to ask them later. Cornell Notes are an excellent way of doing this: you put your question in the Cue Column and leave the right part blank: you can fill this in with your answer at a later date (or by asking the teacher at the end of the lesson). Trying to formulate questions to pose to the teacher while you listen to a lesson is a good way of committing the information being learned to your long-term memory. This works because you’re invoking higher-order thought processes and learning more actively. Read more about active learning here. Students who review their notes achieve higher grades than those who don’t. Repetition is key: the more times you see, hear or read something, the more you’ll remember it. Re-read your notes one day, one week and one month after you write them to keep them fresh in your mind. In the same way that repetitive songs get stuck in your head, repetitive study gets stuck in your head, too. Click to enlarge. With this in mind, review your notes within 24 hours of the lesson and again at regular intervals afterwards. You’ll need to continually improve your notes after you’ve made them: answer questions you left blank in the Cue Column, insert definitions to confusing words, and label the diagrams you left blank during the lesson. 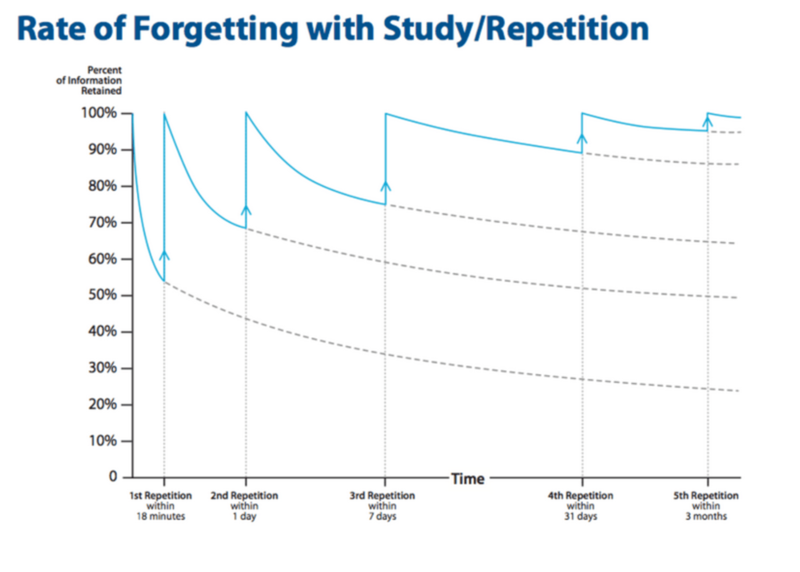 Stay ahead of that forgetting curve! Don’t have time to pre-read the textbook? Nonsense! Skim-reading your textbook section over breakfast takes about 10 minutes, and reading and highlighting key definitions takes just another 2 minutes. By investing 12 minutes of time before class, you’ll learn more during the lesson and waste less time afterwards trying to decode what the teacher was saying. You’ll also have the confidence and the ability to answer to more questions in class. Your peers will start to see you as the person who always knows the answer to the teacher’s questions, which gives you a self-fulfilling reputation for being ‘smart’. Reviewing and fleshing our your notes after class doesn’t take long, either. The exact time depends on the difficulty of the topic. Remember that the time you invest doing the above three things will pay off during the examination. If you don’t have time to do these three things, then make time. Get reading! How do you warm up before class? 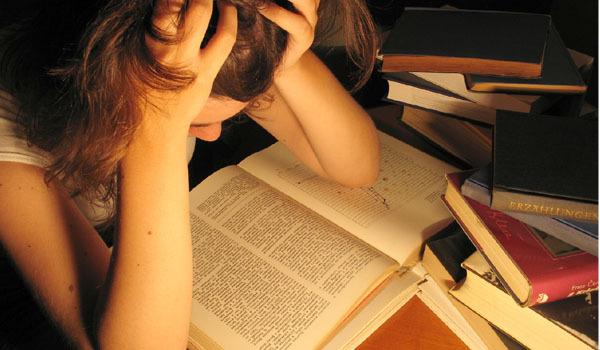 What study habits help you the most? Share your ideas in the comments section below. Choose a space, at least two square metres in area, where you will do nothing but study. It should be located in a bright, warm, comfortable part of your home with very few distractions. It should be a space that faces a wall or a window, and should not be in the middle of a room where other people might continually walk by. When I say “study space”, I’m referring to a high desk (for good posture), a hard chair (to help you concentrate) and the space that immediately surrounds them. Remove every object from that 2m² space. If the desk has drawers, empty them. Clean the desk and its surroundings and remove all distractions from nearby (such as a TV, a radio or a buzzing light). Place only study-related objects in your study space. Textbooks, files, notebooks and plain paper should all be on the desk. Stow the computer away while you’re studying, and only get it out when you need to write an assignment. Because the vast majority of your reading should be done from textbooks, your computer should not be a permanent fixture in your study space. Shut it down and keep it away. Many people say they can’t study in their bedroom. Studies have shown that geographical separation between work and play puts people in the right mindset to do both. Therefore, studying at the same desk that you use to play computer games could be a huge hindrance to your studies. The minority of people who can study in their bedroom have made it a “study space” instead of a place to relax and play. I study best in libraries because being surrounded by other studious people helps to keep me motivated! Libraries in the UK are strictly silent – so even if your friends are there, they can’t distract you. Natural-looking light fixtures in my Cambridge college library also kept me alert late into the evening while I worked. Find a 2m² study space in your home and make it look like a library. 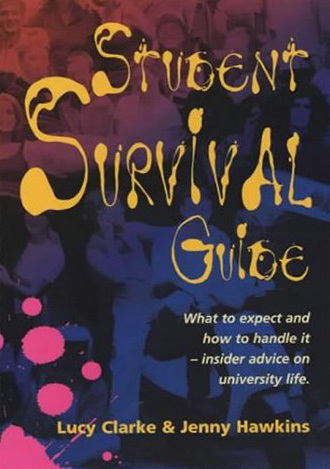 Or, of course, study in your nearest library! 1. Choose at least 2m² in your house as a designated “study space”. 6. Keep your study space immaculately clean and tidy. 1. Do all the required work for your course. This includes the required textbook questions, any weekly quizzes and worksheets or booklets that are provided by your teacher. Refer to the course outline and read the textbook chapters before we study them in class. It makes a huge difference to your level of understanding. Compare your answers in the weekly Chemistry quizzes with the ideal answers on the examiners’ reports. (These will be sent out after each quiz has been completed.) Textbook questions are a bit like reading comprehension questions: they test your understanding of what you’ve just read in the textbook. 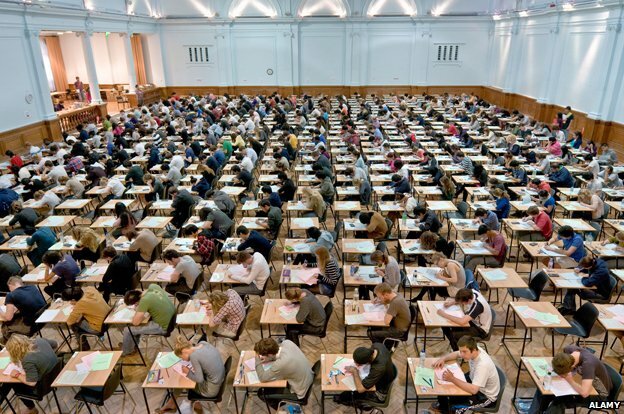 Weekly quizzes are written in a much more similar style to the VCE Chemistry examination you’ll sit at the end of the year. Your goal is to complete all of the questions in the Checkpoints book before 20 July 2015. Complete Checkpoints questions on the topics you study as you progress through the year. Your teacher will sometimes set Dimensions worksheets as an assignment in your VCE Chemistry course. You can always ask your teacher for extra Dimensions worksheets. Note that some of the questions in Dimensions worksheets extend a little further than the scope of our VCE study design. Use additional textbooks for alternative explanations of the same topics. Please don’t use Google to find Chemistry information because about a third of the results are awful (answers.com and answers.yahoo.com are two such examples). Use Heinemann, Dimensions and StudyON instead: these are the three best textbooks for our course. Complete questions from these textbooks for additional practice on certain topics as required. By June 2015, you will have finished studying all of Unit 3. You will therefore be able to complete Unit 3 practice examination papers from VCAA’s website (or from your teacher/tutor) by this time. Complete past examination papers in exam-like conditions and check your answers critically using the examiners’ reports provided. 9. ASK YOUR TEACHER/TUTOR FOR HELP! If you get stuck, just ask your teacher/tutor for help. Send them an email saying “Sir, I have no idea how to answer this question!” or knock on their office door for advice. They’re always happy to help! Remember the 5-minute rule. If you’re stuck (i.e. making no progress) on a single question for more than 5 minutes, ask for help and move on. Re-do the question once your teacher or tutor has responded with tips as to how to answer the question. Do you know of any more study tips that aren’t in this list? Add them in the comments section below. Hydrolysis (or formation) of a triglyceride. Click to download PDF version for printing. Visualising reaction mechanisms in VCE Chemistry can sometimes be difficult. Making plastic models helps, but I’ve been thinking that it would be much more convenient if students had their own paper version of molecular models that they could keep for themselves and use at home. 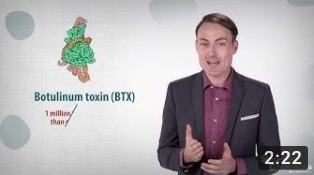 That’s why I created Foldable Biomolecules. Each Foldable Biomolecule is a PDF template that students can fold into a shape that demonstrates a chemical reaction clearly. Pull apart the edges of each sheet to visualise a hydrolysis reaction, and push them back together to visualise a condensation reaction. These paper-based biomolecules are downloadable, shareable and much quicker to set up than their plastic counterparts. You can also download the complete set of Foldable Biomolecules as a single PDF here. The VCAA Chemistry Data Booklet contains answers to many questions you’ll be asked in the end-of-year examination. Unfortunately for students, however, the information it contains is neither explicit nor complete. Students need to know how to use the data booklet if they are to make the most of it. Many formulae and definitions still need to be learned. For example, the data booklet doesn’t give you calorimetry formulae, and hydrogen bonds aren’t shown on DNA nucleotides. Trends are missing from the periodic table, and the electrochemical series comes with no annotations whatsoever! All this extra information needs to be memorised for VCE Chemistry. I’ve annotated a real VCAA Chemistry Data Booklet to help you understand it. You can download it here. Solubility rules are added on the back. It’s so much easier to change your teaching style at the beginning of a year than in the middle. This is because new students in a new class after a long summer break are much more receptive to change than the ones who are already used to the way you teach. In fact, most students return from their summer vacation eagerly expecting something new! The following checklist is based on what I’ve learned since I started teaching in September 2006; and I believe it’s a great way to start teaching a new class. Start with the following columns: Surname, First name, Email address and Gender. Make columns for any compulsory assessment tasks (raw score and percentage). If any assessment tasks are submitted late, just add a comment to the relevant cell in the spreadsheet. Nothing more needs to be recorded in this database. Keep it really simple! Use your email client (e.g. Outlook) to create groups for (a) your students and (b) your students’ parents. You’ll use these to distribute resources and reminders in future. Send an introductory email to the parents and attach the course outline. For most students, this will be the only time you ever email their parents. Just send them one message to establish contact at the start of the year, and they’ll feel welcome to email you if they have any concerns regarding their child’s progress in your subject. Remember to put their addresses in the bcc field to hide their addresses from each other! See next week’s post on creating start-up packs for VCE Chemistry students, or make a similar start-up pack for the students in your subject. Take the time to put all your students’ birthdays into your calendar at the start of the year, then wish them a happy birthday face-to-face on the day. This builds rapport, and students really appreciate it! Teachers need to be very familiar with all the resources they give their students. Just as you’d pre-watch a YouTube video before you show it to the class, you also need to pre-read the textbook before you endorse it and use it in class. Unless you’re already done so, read all the textbooks for all the subjects you’ll be teaching from cover to cover. Make notes in the margins as you would expect your students to do. Highlight important facts carefully and summarise every paragraph all the difficult sections in your own words. These will be the words that you write on the whiteboard (along with any important diagrams) during the lesson. See my post on How to Read a Textbook: 6 Rules to Follow for more information. Any extra resources you want to use (e.g. YouTube videos) – you can always use more later; add them to the course plan if you do. Assignments / tests and their due dates. Give each assignment/test a name and stick to it. Label how much each assignment/test counts towards the student’s final grade. Experiments. Label how long each experiment takes and plan which days to do each of them for the entire term in advance. 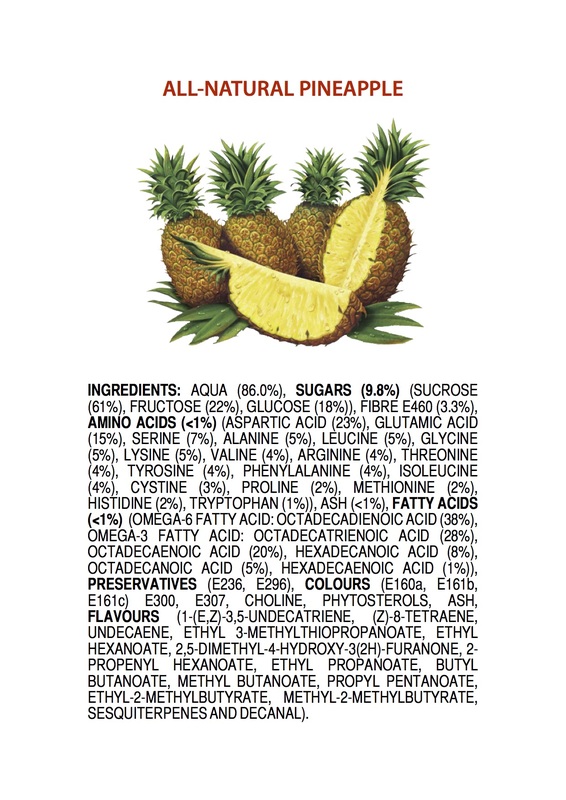 Dialogues about misconceptions are a brilliant way to introduce new Chemistry topics. Derek Muller, founder of the YouTube channel Veritasium, explains this beautifully. 9. Find out what’s going to be on the tests and exam! Not all schools teach all topics on the curriculum, and not all schools test all the topics in the examination. Find out the topics to be tested on the tests and examinations and tell the students in advance (with textbook chapter references) so they can plan their revision. Allow the students to choose their own seats in the first lesson. Sketch a map of the room so that during the introduction session, you can label who chooses to sit where. Tell the students that you will modify the seating plan every calendar month to break up students who don’t work productively together. Be very strict about maintaining the seating plan. 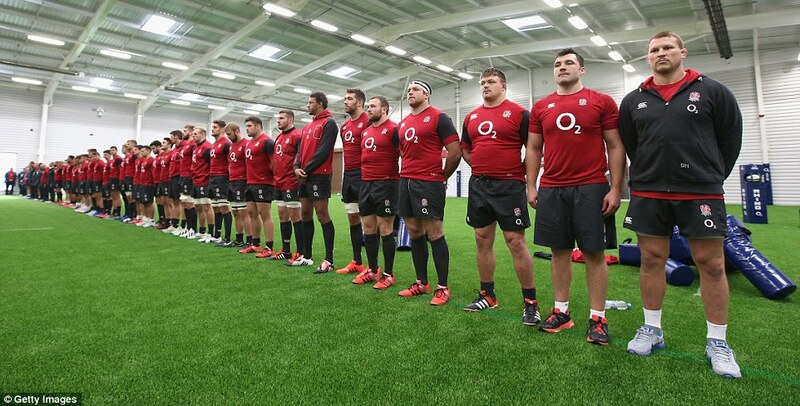 This creates an atmosphere of order, structure, fairness and respect very early in the year. Be strict about punctuality and homework as well. Ask around the circle again: “What is [Chemistry/Physics/History]? Sit down. Teacher answers questions 1 and 2 for the class. Distribute the start-up packs and show their contents. Show students the textbook and get them to write their names in it. Don’t be afraid to write in your textbook! Revision of fundamental concepts from last year (a worksheet). Use this to recap the required knowledge for this course. Start teaching the theory behind first topic to be learned. Follow textbook closely. Do the first week’s experiment in the third lesson if possible. For year 11, doing flame tests in watch glasses is a great place to start. Keep the students motivated by questioning every aspect of the experiment: why use methanol, not ethanol? (Try both!) Why does methanol emit light when it combusts? 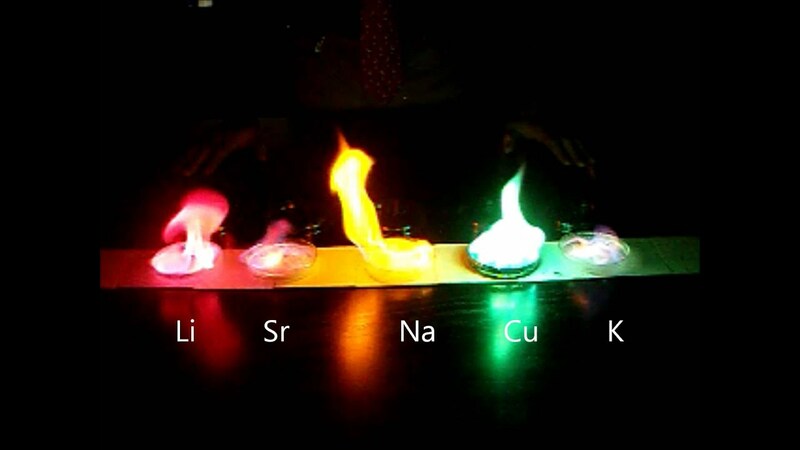 (Electrons absorb energy/emit quanta of light) Why does the presence of metals change the colour of the flame? (Electrons at different energy levels in different elements emit light with different wavelengths when falling back to their ground state, producing different colours). Thank the students for their honest feedback on Monday. Honest feedback builds rapport! how to reference those resources in an assignment (using Harvard or APA style). Is there anything I’ve missed out? Write in the comments section below. If you’ve ever tried Beats® headphones, you’ll have felt the rich, powerful baselines they give you without overwhelming the rest of the music. Beats® and its music streaming service, BeatsMusic, have become so popular so fast that they now recently acquired by Apple for a whopping $3 billion, making co-founder Dr Dre the most financially successful hip-hop artist of all time. By far. Here’s how this best-selling product works. 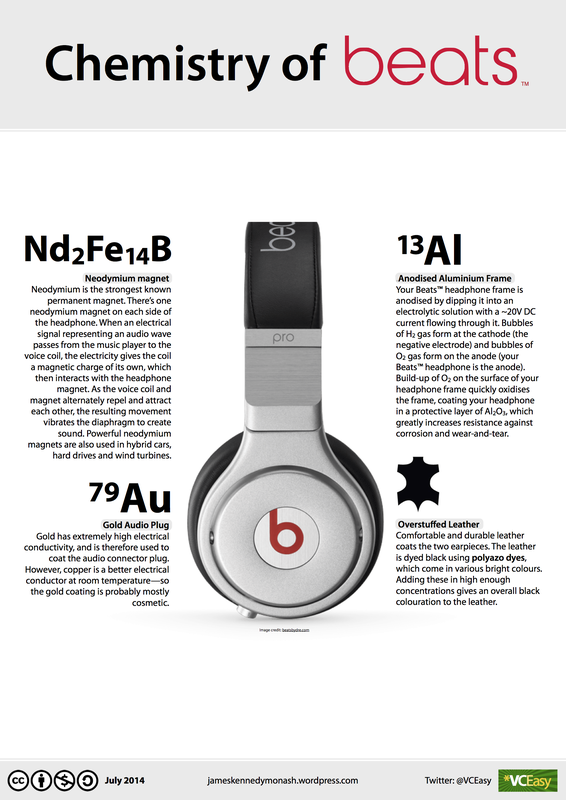 Each headphone contains a neodymium magnet (the strongest known permanent magnet). When an electrical signal from your iPod (or similar) passes through the gold-plated audio cable to the voice coil, electromagnetic induction gives the voice coil a variable magnetic field. The exact strength and timing of the variable magnetic field represent perfectly the music being played. The voice coil’s magnetic field then interacts with the magnetic field of the headphone’s neodymium magnet via magnetic attraction (or repulsion), which moves the diaphragm, which sits between the magnet and the ear. When the diaphragm moves, it creates differences in air pressure (sound waves) that are detected by the diaphragm in your ear. Excellent sound quality requires an air-tight seal between the headphone’s diaphragm and the diaphragm in your ear. Overstuffed leather guarantees this air-tight fit. Leather requires over 20 treatment processes before it’s ready to use in manufacturing. One of those processes is dying using polyazo dyes. When used in lower concentrations, these dyes are brightly-coloured; when mixed together and used in very high concentrations, they give an overall ‘black’ appearance to the leather. Maosen Zhong’s annotation of Dizigui (“Rules for Children”). Written in Chinese. Recommended for all under 40 years of age. Study the original text intensely before reading. I’m already a fan of Maosen Zhong’s teachings. Recently, I finished reading his annotated collection of classical excerpts on femininity called 窈窕淑女的标准 (which roughly translates as “How to be a Fair Lady“). I gave it five stars and recommended it for men, too. Dizigui (pronounced ‘deetzergway’) is an ancient Chinese classic that teaches children and adult students how to behave in daily life according to ancient Confucian principles. It focuses mainly on how to treat ones parents and teachers with “禮”, or “lǐ”, which is roughly translated as “respect”. 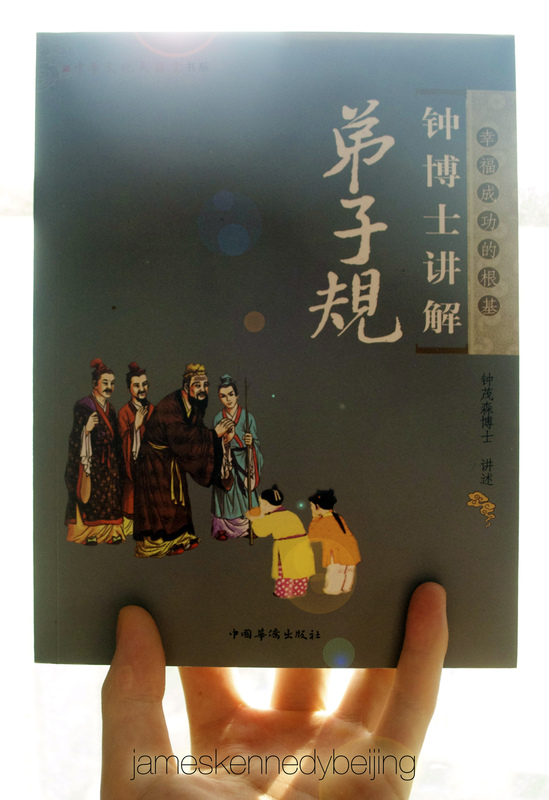 Since Confucius placed so much emphasis on 禮, a book that fully expounds its meaning comes as a great relief. See no evil, speak no evil, hear no evil and read no evil. …and many more, with stories to illustrate each rule. Zhong interprets and illustrates these rules using his own (usually exemplary) experiences and the (usually erroneous) actions of others. The original text consists of 360 lines of three characters each, which form a beautiful poem just 1080 characters long. Zhong has printed this original text in full at the beginning of the book, which you should study meticulously before reading. The author expounds each line in great detail (sometimes too much detail) later on in the book—so I strongly recommend trying to make your own interpretation of the text before reading the author’s.